Portland has a nice street of small businesses and shops along Southeast Belmont, bustling without being San Francisco-style boutique. The University District or Capitol Hill each might have had a Belmont if Seattle encouraged innovative urban planning and enlightened landlords. What do we have instead along the Ave and Broadway? Big chains and panhandlers. After a line-by-line comparison of PAM (Portland Art Museum) vs SAM (Seattle Art Museum), Regina concludes Seattle should stop looking down on its neighbor and hook up and include Vancouver into the mix. Yet, again, and I will include myself here- instead of laundry lists of failures, I’d love to hear/find a solution to this problem. Indeed, well grounded coverage of the Pacific Northwest would be great- so who wants to pay for the gas money? On a more is more note, tonight at 5:00pm (PST) on Eva Lake interview’s Jeff Jahn on her Artstar Radio show, broadcast and archived for your listening pleasure out here. 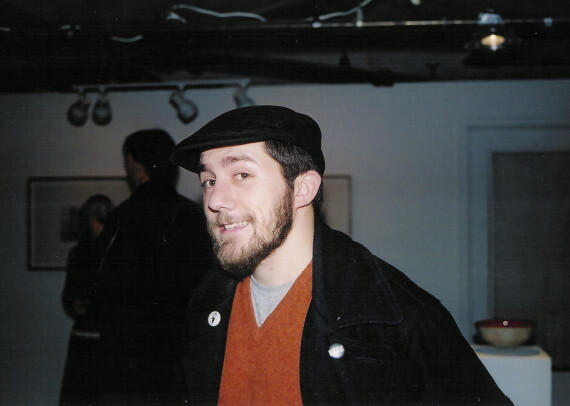 Tune in and get an earful of what Jeff has to say about Portland and the art world in general. I’ve been following the machinations of Mr. Jahn for a year now and while of course I can’t concur with everything he says, I was pretty impressed by his recently curated Fresh Trouble show and endless enthusiasm for what is going on down there. I will have Jeff Jahn on the radio. While he just curated two shows in town (Fresh Trouble and Inertia at Gallery 500), I plan on focusing a bit (if he’ll let me!) on the big picture. 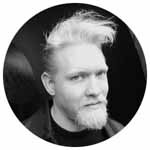 I’d like to talk about how his whole scheme as a curator has changed and grown since he’s lived here, what evolutions he’s witnessed amongst the artists and the town in a general sense and where is it all going. Knowing Jeff, the ultimate optimist, it’s all going to some good, grand, overwhelmingly better-than-New York place.I can’t say I agree, thought God knows it’s not like Chelsea is some joy ride. Tune in….or save it for Sh!tstorm next week. 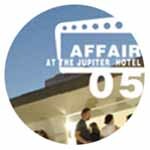 What can I say, the Affair at the Jupiter was once again a blast. We got a nice 24 hour immersion of all things art including going to some of the galleries around Portland and especially viewing Jeff Jahn’sFresh Trouble, which if you are still in the vicinity, I would highly recommend (it’s up for another weekend). The Affair this year attracted more gallery participation from outlying areas and I was especially surprised by the amount of galleries from San Francisco. Perhaps the best part of the whole event was not one specific gallery or artist but the fact that the event was being held in an old school hotel, meaning each gallery was given the challenge of showing work in a postage stamp size space. This meant lots and lots of small works, especially drawings, which was a real treat to see. My personal favorite design challenge was to see how people dealt with the bathroom. The savviest spaces utilized the commode to their advantage, some even mounting artwork on the mirror. The worst were those who probably had no idea what they were getting into and used the tiny ship size room as an afterthought or even worse- unorganized storage area! The artist preview on Friday night was a hilarious event that most of the galleries ended up closing down their spaces for fear of keg cups being lodged on art. Before hitting the Jupiter on Friday night we took a taxi over to Fresh Trouble, a huge sprawling but well utilized warehouse show. Where the Jupiter worked best emphasizing work on a small scale, the advantage of Fresh Trouble is its hugeness of scale and ability to house work of jumbo proportions. Walking through the door you grab a map and then amble on – the entire project (including thoughts of who got to install it) was impressive. Saturday after giving the Jupiter our undivided attention saw us hitting some of the gallery spaces downtown. We were lucky in locating new space Gallery Homeland by the waterfront (620 SE 3rd Ave) and speaking to Co Director Paul Middendorf. I forgot to ask Middendorf about looking at the flatfiles they have gathered; being a flatfile fan and wishing more spaces utilized such an item (again, favoring more small work). Keep your eye on Homeland, it sounds like they have lots of exciting ideas in store. Outside of Homeland, hitting the downtown galleries was anti-climatic after all the compressed energy of what was happing over at theJupiter. It was nice to see the large new immense space of PDX but I think most of the spaces put their effort elsewhere for the weekend. Another exception though, as a bonus, we stopped by Froelick Gallery to see Robert Yoder’s new show which looks great. Also in the same area on Friday afternoon, after getting into town and being completely soaked in a rain storm we stopped by to say hi to Eva Lakeat Chambers Gallery. This was a beauty of a show with a rarity for the weekend- two painters. Always good to chat with Eva and it was wonderful to see the new space. We started and ended our journey at Veganopolis. Good food, but better art at V-Gun gallery with the Bruce Conkle/Marne Lucascurated Trippin’ Balls: A Mycological Exploration with all its mushroomy goodness in full bloom. After sitting out an insane hail storm and noting how schizophrenic the weather had been the entire visit, we hit the road again. It appears there is no shortage of coverage of the Jupiter this year! That’s a good thing as after my own camera for documentation purposes pooped out (Yvette and I realized it was time to go home when both our camera batteries had bit it). From what I hear, most art fairs don’t bring to mind a completely great time. I think other art fair organizers should look to the intimate scale and unpretentiousness that the Affair offers and take a note or two. PORT non-stop coverage, especially Isaac Peterson’s Affair Photoblog. Eva documented some of the gallerists. The Oregonian covers Fresh Trouble. Off to the Affair, and Fresh Trouble and Chambers and anything else that gets in my way. More soon! 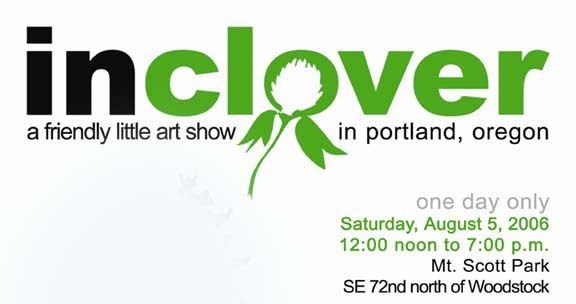 Tonight, I’m proud to be part of a new show at the outstanding gallery space in Portland known as V-Gun. 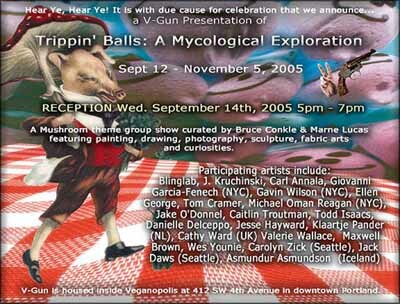 The exhibit called Trippin’ Balls : A Mycological Exploration was curated by the illustrious Bruce Conkle and Marne Lucas. Just in time for the fall mushroom hunting season. The reception is from 5-7pm. I’m looking forward to seeing the show when I come down later this month. After seeing art in the four major cities of the Pacific Northwest in less than the past week, I’m pooped. Time to stay home and make some art. 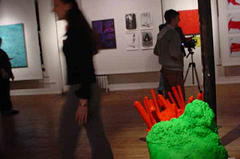 In the meantime, here are images from Gallery 500’s opening last night (or slideshow if you please). It was great fun, more commentary soon. Jennifer McMackon, who runs the lovely and thought provoking simpleposie site has been generous enough to let me put in a special guest appearance today by means of a Pop Quiz for Painters. Thank you Jennifer! 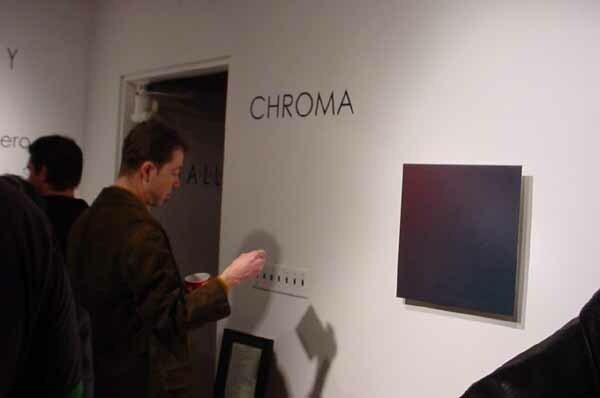 And I’m hitting the road today, venturing south to witness Portland’s First Thursday gallery crawl with my own eyes and to attend the opening of Chroma at Gallery 500. The show, being put on by Telegraph Arts includes a showcase of 6 simultaneous film, live dance, and live music performances. There is also a visual art component including artists: Michael Knutson, Jacqueline Ehlis (whose work I have been dying to see for a long time), Albi Spring, Tom Cramer, Tara Jane O’Neil, Molly Vidor, Tarina Westlund, Gretchen Gamble, Christine Morlock Vogt, Julie Clainos and I am thrilled to tell you I have a piece included too. More importantly I will be finally meeting some of the fine Portland folks like Eva Lake who has been sending up an nice long olive branch from PDX, as well as organizer and man about townJeff Jahn. To prep myself I am catching up with the latest issues of PAN and Critical i . More about my thermos of coffee and $1.99 road trip soon. The contemporary alternative gallery of Suyama Space, located at 2324 2nd Avenue in Seattle presents sculptor Roger Feldman in a site-specific installation entitled ROCK. The exhibition is open to the public January 31 – April 22, 2005. 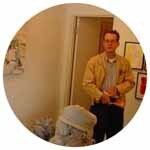 The Seattle artist will present an installation lecture at the gallery on Saturday, January 29 at 12 noon. Gallery hours are Monday – Friday, 9 a.m. – 5 p.m. and admission is free to the public. Feldman is described as being an architectural- constructivist sculptor, and with the creation of three separate structures going into Suyama, should be an interesting use of their cavernous exhibition room. More on Feldman’s sculptures here. In the Fall of 2003 Sam and Laura were sitting in the Polish Laundromat (Laundry/Prania) around the corner from the then Red76 headquarters in Chicago, IL. They got to thinking about places you wait in. Places wherein their function is mainly sitting around for something to happen. From this the Laundry Lecture Series was initiated. Why not set up a series of talks in your local Laundromat? Why even ask the owners? We didn’t. As long as you are a paying customer what’s to stop you from gathering you and your friends to talk about whatever you’d like, as the socks get lost, and your favorite pink t-shirt gets frayed one more time in the dryer? Nothing, we say. Go ahead, get your friends together, feel free to be open and honest wherever you are. Speak your mind. Share your thoughts: in Laundromats, on checkout lines, and so many other wonderful shared-use venues all over the world. Please bring your laundry along to wash at all lectures in this series. Not only will you leave with a fresh perspective on the world, but a fresh perspective on your wardrobe as well. at any rate, interesting stuff is definitely going on in both back yards. Please note the mention of the lovely Eva Lake on PAN’s list and rounded out by Jeff Jahn. I personally think the mere existence of PAN presents a strong case for its self as superior, by the fact alone there is enough material down in Portland’s art world to find satire in.